Farmland prices in Illinois decreased modestly during the first half of 2015, and it appears that downward pressures are likely to continue into 2016. While headwinds related to farm income will likely continue, current farmland prices do not appear out of line with current cash rent and interest rate levels. That is, farmland price bubbles or conditions that would be seen as such are not evident in the current market. If large farmland price decreases do occur in the near future, it is likely that they would be associated with unexpected interest rate increases or additional shocks to expected future agricultural income. Likewise, increases in commodity prices that are viewed as more permanent, along with interest rates, could cause farmland values to rise. In simplest form, the price of farmland should equal the discounted sum of all future expected returns to farmland (see here for more detail). Obviously, returns and discount rates in the future are not known with certainty. Future returns expected to accrue to farmland often are proxied by cash rents, with the presumption that current rent levels provide some indication of future rent levels. Current interest rates are often used to measure discount factors. Cash rent levels and interest rates are discussed in the following two sections and the combined effects of the two factors then evaluated in the “Capitalized Values and Farmland Values” section. Higher cash rents usually lead to expectations of higher farmland returns in the future, thereby leading to increases in farmland prices. 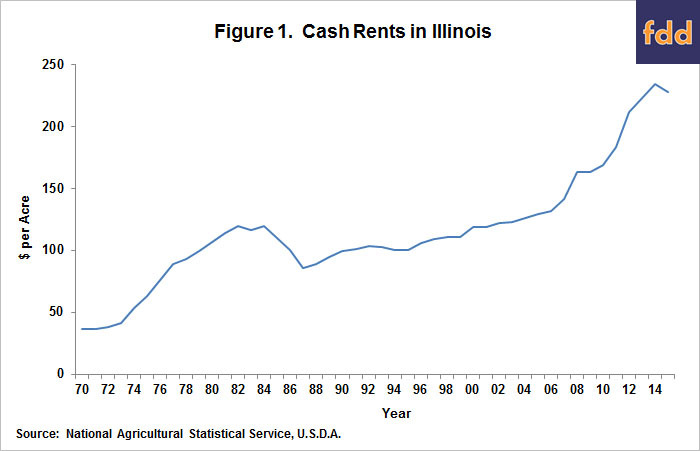 Figure 1 shows average cash rents in Illinois from 1970 through 2014 as compiled by National Agricultural Statistical Service (NASS), an agency of the U.S. Department of Agriculture. As is well known, cash rent increased substantially from 2006 through 2014. In 2006, average cash rent in Illinois was $132 per acre (see Figure 1). Average cash rents were $234 per acre in 2014, representing an increase of $102 per acre since 2006. On an annual basis, cash rents increased by an average of 7.5% per year between 2006 and 2014. Average cash rents decreased from $234 per acre in 2014 to $228 in 2015, a decrease of $6 per acre. Expectations are that cash rents will continue their decrease into 2016. Professional farm managers are indicating that rents will decrease by roughly $30 per acre according to a recent survey (farmdoc daily September 22, 2015). Rents on professionally managed land generally react more quickly to changes in economic conditions than non-professionally managed farmland, therefore, a $30 decrease on professionally managed farmland is not likely to translate immediately to a $30 decrease on all farmland. A decline in interest rates generally has a positive impact on asset prices, particularly long-lived or non-depreciable assets. Lower interest rates decrease farm mortgage costs thereby reducing the costs of acquiring farmland. And, lower interest rates correlate with lower returns on alternative investments, making farmland more attractive as an investment. Obviously, higher interest rates have the opposite impacts as those listed above. A reasonable proxy for the farmland capitalization rate is the ten-year Constant Maturity Treasury (CMT) rate. 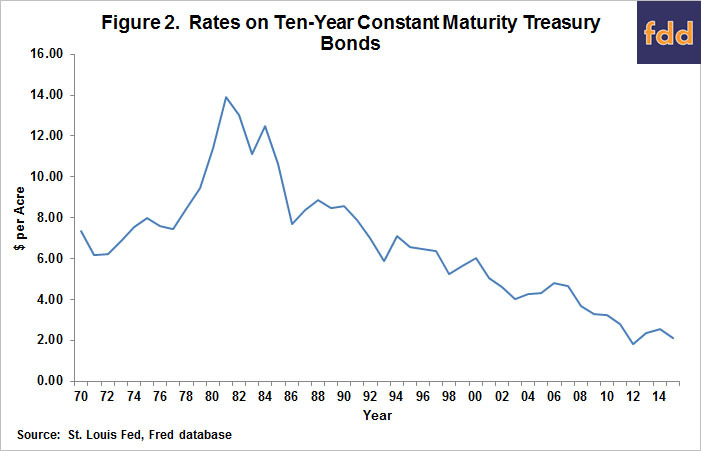 Since achieving a high of 13.92% high in 1981, ten-year CMT rates trended downward, reaching a low of 1.80% in 2012 (see Figure 2). This downward trend has had a powerful, positive impact on farmland prices, and on long-term asset values in the broader market. It can be argued that the rate environment has had a greater impact on farmland prices than farmland return increases. Since the 2008 financial crisis, the Federal Reserve Bank (Fed) has followed policies designed to maintain low rates with the intent to encourage additional economic activity and related growth. The Fed has indicated the current low rate policies will soon come to an end. Of course, they have been indicating so for several years, and global economic concerns appear to have postponed these efforts at least until the end of 2015 and perhaps for even longer. In any case, the ten-year CMT rate has averaged 2.12% during the first three-quarters of 2015, below the 2.54% average rate during 2014.
where income is measured by cash rent and the discount rate is measured by the ten-year CMT rate. The red line in Figure 3 shows the resulting implied capitalized values. Also shown in Figure 3 are actual farmland prices for the same period (blue line). The relationship between the capitalized values and actual farmland values is important to appreciate. When farmland prices are above the capitalized value, the fundamental return and rate drivers of farmland prices suggest that either farmland prices are too high or that there are expectations for future increases in returns or lower rates. An extended period with prices well above implied capitalized values occurred in the 1980s, prior to the fall in farmland prices during the agricultural financial crisis. 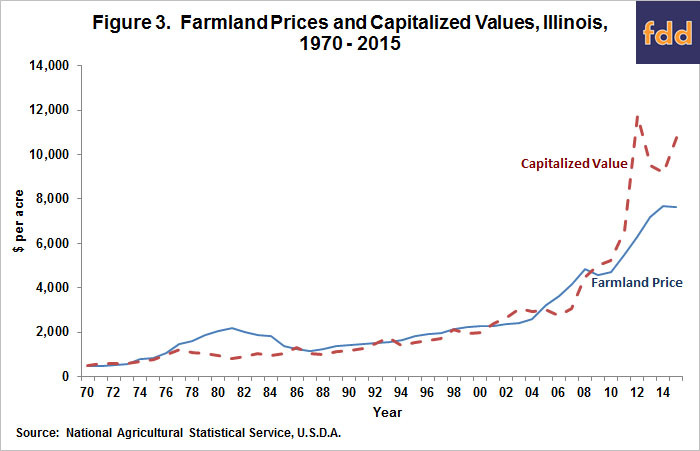 Between 1984 through 2006, farmland prices and capitalized values tracked each other closely. Since 2006 however, the capitalized values have been above actual farmland prices. An interpretation is that capitalized values are not suggesting that farmland prices are overvalued, or that the income experienced in that period was not viewed as totally permanent. In the past year, simple application of the formula resulted in the capitalized value increasing from $9,213 in 2014 to $10,754 in 2015. This occurred because the ten-year rate decreased from 2.54% in 2014 to 2.12% – a greater percentage decline than the percentage decline in income. Importantly, at low interest rate levels, capitalized values are very sensitive to rate changes. While capitalized values increased between 2014 and 2015, actual farmland price decreased from $7,700 to $7,650 (see Figure 3). In addition to NASS reported values, other reports also suggest that land prices are declining (click here for values in the Seventh Federal Reserve District and here in Indiana. The Illinois Society of Professional Farm Managers and Rural Appraisers reported price decreases between 2 and 7% during the first half of 2015 (click here for more detail). These farmland price decreases are likely occurring because of fundamental conservatism about the agricultural economy, and anticipation of rate increases. While farmland prices likely will continue to see downward pressure into 2016, the capitalized values do not suggest that farmland prices currently are too high or in a bubble condition. Stated alternatively, capitalized values relative to farmland prices do not point to a situation like the 1980s in which the driving forces of farmland prices directly suggesting farmland prices were above their fundamental values. Cash rents likely will face downward pressures in the next several years. However, cash rents would have to fall considerably before the capitalized value is below current farmland price. Given a 2.12% ten-year CMT rate, cash rent would have to be $162 per acre before the capitalized value would fall below the 2015 farmland price of $7,650 per acre. A $162 per acre cash rent is $66 per acre below the 2015 cash rent of $228 per acre, a 29% decrease in cash rent. If corn prices continue in the mid to high $3.00 per bushel, cash rent could decrease by the 29%. However, a return to corn prices in the mid-$4.00 per bushel range likely would not result in cash rent falling by 29% and would continue to result in capitalized values above farmland prices. Small increases in interest rates could also have a dramatic impact on capitalized value. Take the 2015 cash rent of $228 per acre and 2015 farmland price of $7,650 per acre. An increase in the ten-year CMT rate to 2.98% would cause the capitalized value to equal the 2015 farmland price. The 2.98% rate is only 86 basis points higher than the current rate. The last time the actual ten-year CMT rate exceeded 2.98% was in 2010, only five years in the past. However, it is not evident that interest rates will rise in the near term. The Fed continues to discuss ending low interest rate policies, but continues to push the ending of those policies into the future. Moreover, interest rates near the middle of the yield curve may not rise at the same rate as short-term rates as the Fed begins to implement policies to raise short-term interest rates. One note for those who believe rising rates will occur very soon. Because farmland is a long-lived asset, farmland faces larger potential price decreases than other assets if interest rate increases do occur that translate to changes in the real capitalization rate. However, prices on most other assets will face downward pressures as well if that did occur. Bonds and other debt-based instruments will be the first financial instruments to have price decreases if yields increase. Stock prices would also be expected to face downward pressure. Under such conditions, farmland also may appear to be a safe-haven investment and fare well in many investors’ eyes given the current economic concerns surrounding slow economic growth and large, unsupportable amounts of sovereign debt. Holding a real asset such as farmland may have value in a portfolio of financial assets, particularly given that farmland has fairly stable current returns and has also historically been positively correlated with inflation. The simple capitalization approach used in this article does not suggest that farmland is currently overpriced relative to the current cash rent and interest rate levels. Lower cash rents and higher interest rates could cause farmland price decreases, and downward pressures likely will be evident in the coming year. However, these factors will likely play out under rational adjustments to asset prices. Schnitkey, G. "Decreasing 2016 Cash Rents on Professionally Managed Farmland and Lags in Cash Rent Changes." farmdoc daily (5):174, Department of Agricultural and Consumer Economics, University of Illinois at Urbana-Champaign, September 22, 2015.